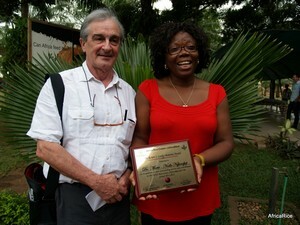 Dr. Marie-Noelle Ndjiondjop, a Cameroun national, Molecular Biologist and Head of the Biotechnology Unit at AfricaRice (formerly ADRAO), Benin, has received the Dr Robert J. Carsky Award for Internationally Recruited Staff (IRS) due to her very important contributions to rice international science. Marie-Noelle Ndjiondjop graduated from University of Montpellier 2: she holds an MSc on “Influence of agro-climate conditions on rice technologic quality”, 1995 (under the supervision of CIRAD) and a PhD degree on ”Heredity, mechanism and mapping of a marker linked to rice yellow mottle virus resistant gene in rice”, 1999 (in partnership with IRD research center). Dr Robert J. Carsky Award is given by AfricaRice, a CGIAR international research center on rice for Africa; it recognizes each year a scientist (International Recruited Staff) and a team (General Support Staff) who made outstanding contributions to rice research, training and research support in Africa. This annual award was set up to honor the dedication of the late Dr Robert J. Carsky, who served as Agronomist at the AfricaRice until his tragic death in 2004 in Côte d’Ivoire. The prize (1000 USD) is handed over each year on the occasion of the Board meeting at the AfricaRice .